The replay date is still to be confirmed. The fourth-round draw will be on Monday. The next FA Cup football coming your way on the BBC Sport website is just a few hours away. We will be bringing you all the upsets as they happen here with build-up from 09:00 GMT. The final word in that Tweet is supposed to be Leeds I think. Hopefully LFC Match by Match's maths was more accurate. Either way, this was a team that can barely remember their team's 4-3 classic against Newcastle in 1996. Neil Michael Owens: It was worth watching just to see #JurgenKlopp's interview at the end. Funny, honest & compulsive viewing! Klopp described Tom Nichols's opener as a "wake-up call" but in his own brilliant style - saying "klonk!" as if the goal had hit him directly on the head. He makes a metaphor come alive that guy. "We've been working all week on those corners - put it in the mixer and right on top of keeper Adam Bogdan. We knew we could cause an upset. We're disappointed we didn’t come away with a win." There were several bright performances from Liverpool's youngsters. Joao Teixeira was lively, especially in the first half. He took on more players than any other Liverpool man (21). Cameron Brannagan made more passes (59) and more tackes (four) than any of his team-mates. And left-back Brad Smith got forward well, scoring the second equaliser, and had the second-highest number of touches for Liverpool. "It was a brilliant 94 minutes of football. From start to finish it was entertaining. What a night for the Exeter chairman and the football club. As for Liverpool, the experience the kids will get from tonight will carry them on for the rest of their careers." Liverpool manager Jurgen Klopp on BBC One: "It's obvious what we have to learn in the future. We have to be more robust. It was a difficult pitch. Exeter did really well. Maybe they know which part of the pitch you can play football. It was really difficult for us today. On one-on-one situations they were more robust than our guys." "The first goal was unlucky for us - it was their first attack. I won't say anything about the second goal - they showed it live on the BBC. I can't believe we have to play another game now. You want it like this so we will be there." "I mix some team together and you say 'show me the future'. It can't be the future. The players helped us in our situation." BBC's man of the match, Exeter's Tom Nichols: "I thought the boys were brilliant. We thoroughly enjoyed the draw and have a trip to Anfield. On his goal: "I was doing work with one of our coaches the day before. It was a great ball into the area and I got a foot on it. The fans have been different class the last four of five games." Nichols was a busy boy. As the touch map above shows, he covered every blade for his team. 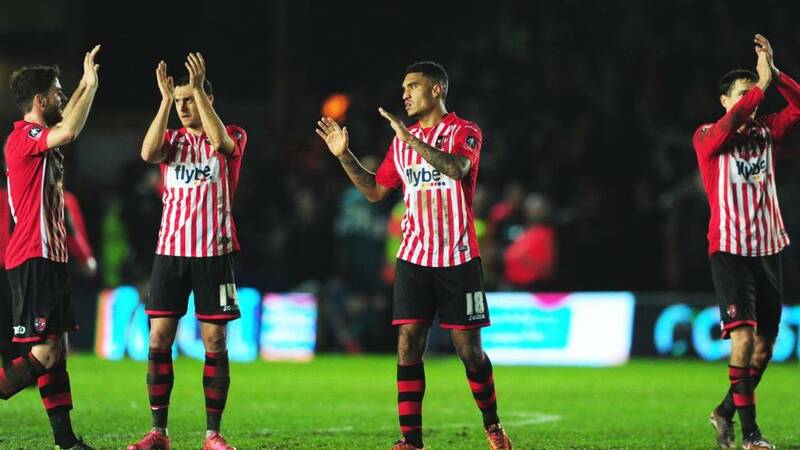 "It was fantastic from Exeter. They won't be disappointed to go to Anfield. They could have won the game but give credit to Liverpool because they hung in there." Exeter's fans have not gone anywhere. They are sticking about to congratulate their team. Fully deserved. And their team rightly return the gesture with applause for their support. It has been bubbling all evening at St James Park. A right old ding-doinging Cup tie comes to an end. Exeter earn a replay and might have had more. Jurgen Klopp learns what the FA Cup is all about. And he gets a view of a tin-foil trophy cut-out bobbing among the home fans as he heads down the tunnel. "Exeter's Tom Nichols has been superb from minute one. He's shown quality and endeavour and will be playing a higher level very soon." Pedro Chirivella can't find a pass into the box from the edge of the Exeter area. Jordan Moore-Taylor meets an Exeter corner. His header is going nowhere, but was he taken out in the air? An optimistic shout from the hosts. No dice from the referee. As we wait to see if there's a late winner in this match, here's another chance to watch Liverpool's equaliser. A big goal for Jurgen Klopp. Cameron Brannagan tracks an Exeter midfield runner all the way and gets a valuable clearance away. Four minutes of injury time pop up on the board. "I like Brad Smith. I like his confidence. He has a tenacity about his play."